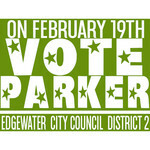 Jennifer Parker for Edgewater Council DIstrict 2 requests some further information. We sent you confirmation via email with complete details of your payment. Please allow admin@campaignhq.com in your spam filter to be sure you receive our message. Jennifer Parker for Edgewater Council DIstrict 2 is managing the funds for this campaign.